Revere Beach is located just north of Boston. From the late 1890s to the early 1960s, the beach contained a popular amusement park. Revere Beach was considered to be Boston's Coney Island, and on weekends it was common for 100,000 people to visit the beach and amusements. The beach contained many dance halls, ballrooms, and bars. Famous singers performed at Revere Beach. The park was easily accessible by auto, streetcar, and narrow gauge railroad. There were usually 2-4 roller coasters operating at the same time at Revere, including the famous Cyclone and Virginia Reel. 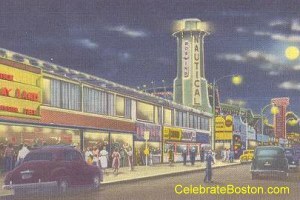 Revere Beach was very crowded at night, and attracted a lot of young dance hall patrons from Boston. Postcards exist labeling Revere Beach Boulevard as The Great White Way due to all the bright lights at night along the (concrete) boardwalk. The beach also attracted a rough & ready crowd, with many sailors, juveniles, and aggressive young men going to the park on weekends. This element dated to before World War I, and was a serious problem by the early 1960s. "Federal troops from Fort Banks [Winthrop] were rushed to Revere Beach tonight after a crowd of sailors and marines had attacked a Metropolitan Park police officer, who had a attempted to arrest a sailor on the charge of drunkenness. While thousands of Sunday night pleasure-seekers looked on, the sailors and marines, joined by a few soldiers and number more than four hundred, took the prisoner from the officer and gave battle to other members of the force. Some of them seized rifles from nearby shooting galleries and opened fire on the police station. The police returned fire with revolvers and shotguns. Five sailors were seriously wounded and there were many minor injuries. Help was summoned from Fort Banks, the Chelsea Police and the Boston Navy Yard. A detachment of 300 soldiers from Fort Banks was hurried to the scene and proceeded with fixed bayonets, to clear the beach. The police estimated the crowd at the beach at the time of the rioting to be 100,000. The Navy authorities gave orders to the navy provost guard that every sailor in Revere was to be arrested. Late tonight more than 100 had been placed under arrest and the authorities seemed to have gained control of the situation. Several patrolmen were injured in the fighting, none seriously. Most of the minor injuries to policemen and bystanders were caused by flying stones when the mob hurled missiles at the police station. The windows were smashed and much of the furniture in the station was broken."